I'm always sad to see certain things get retired, so today is all about celebrating my Top 10 Favorite Retiring Products. 1. 5/8" Crinkled Seam Binding Ribbon -- This gorgeous ribbon comes in Berry Burst (my favorite), Night of Navy, Emerald Envy, and Peekaboo Peach. I love the crinkly texture and ease at tying bows. Thankfully I have a good chunk of Night of Navy ribbon left in my stash. 2. Tutti Frutti DSP $10.00 145606-- Usually I'm okay with losing the current year's DSP. I love see the new designs and frankly after using the same patterns for an entire year, I am over them. The exception this year is the Tutti Frutti DSP. This 6x6" paper stack is just so much fun! One side had great fruit patterns while the opposite has great single color graphic patterns. 5. Pieces and Patterns Stamp Set $19.00 143843 (Clear Mount) -- Such a cute stamp set! I love the different items and the little embellishment stamps. I think my favorite and most used piece is the little T-Rex. How cute is he? Perfect to make kids's birthday cards! 7. 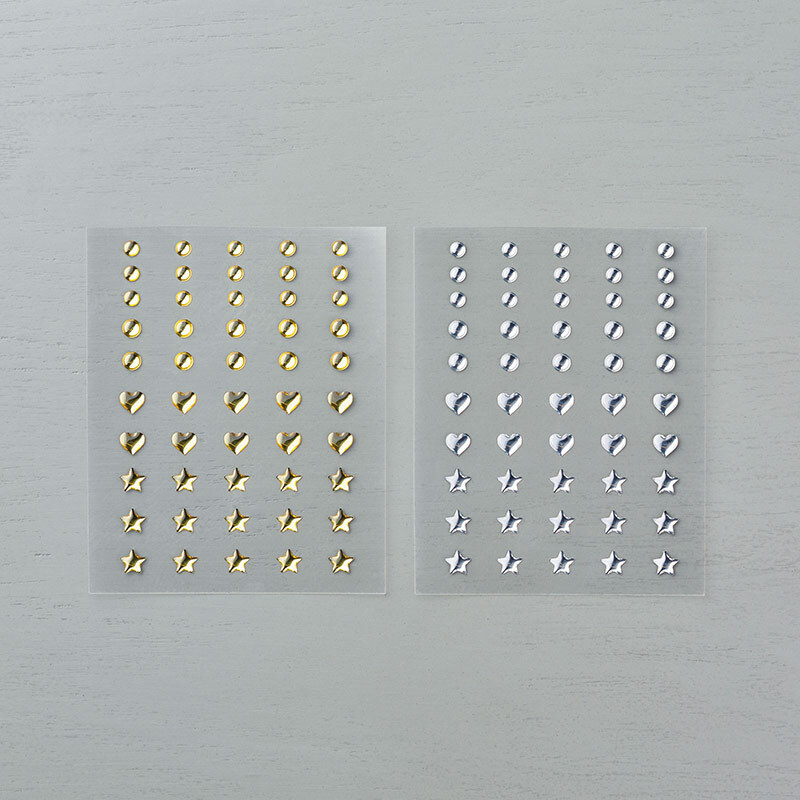 Metallic Enamel Shapes $7.00 141678 -- These cute little silver and gold enamel shapes are one of my go-to embellishments. They add the perfect amount of shine to any card. And the fact that they are neutrals means they can go on almost any card. I'll be sad to lose these ones, but at least the faceted gems are carrying over. And we're getting some new pretty pearls and gems. 8. Magical Day Stamp Set $22.00 145857 (Clear Mount) -- I thought this set was cute when I first saw the Occasions catalog, but I didn't necessarily want it immediately. But then I started seeing cards being made with the set and knew I needed to buy it. I've been having so much fun making whimsical cards featuring these images. I think my favorite might be the mermaid. I'm sure another whimsical set is on the horizon, but I might just have to keep this set for awhile. 9. Brick Wall Embossing Folder $8.50 138288 -- I just bought this one in March and haven't used it that much, but know that it's a great texture. In the time that it took me to put together this post, the folder is completely sold out! 10. Frozen Treats Dies $27.00 142756 -- And lastly, I love the Frozen Treats Dies. These are perfect for making cute ice cream cones, popsicles, and sundaes. I love the combinations you can make and just look at those texture pieces! I'll be sad to lose this one.